As a follow up to last week’s post about head CT scans failing to demonstrate evidence of ischemic stroke in certain situations (early stroke, strokes of small sizes, strokes in the brainstem or cerebellum), I wanted to share several cases illustrating the truth behind the assertion. The head CT image on the right was obtained from a young woman who was 31 years old at the time of her stroke. She presented to an outside emergency department at a small hospital with numbness and jerking movements of her left arm. Her blood pressure was high, and she was discharged home with a diagnosis of hypertension. Her head CT scan was normal at that time. Shortly after arriving home, she developed prominent left-sided weakness, returned to the ER, and then was diagnosed with an early ischemic stroke. 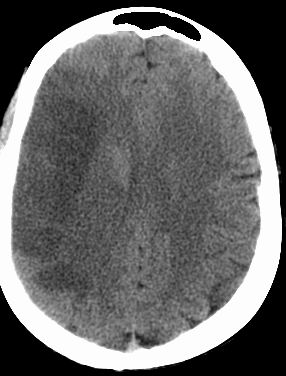 The patient’s right cerebral hemisphere (which is on the left side on our view – the patient is facing us on this CT image, so what we see as the left side is actually the patient’s right side) appears darker than in the left hemisphere. This is because edema (swelling) and ischemic injury have occurred in the brain. Several years later, she has reduced use of her left hand and struggles with anxiety. She and her husband have been a source of great inspiration to me as I have had the privilege of observing them persevere through her challenges. The MRI to the left belongs to a woman who presented to an ER with isolated leg weakness, and a stroke was “ruled out” with a normal head CT scan. She returned home, and later returned when her symptom worsened. Her brain MRI demonstrates acute cerebral ischemia (injury emerging from lack of blood flow) in the territory of the right anterior cerebral artery (the white arrow tip indicates the location of the stroke). See my previous post, A Tale of Two Carotid Artery Dissections, and the Miracle of the Circle of Willis, for a tutorial on the major arteries bringing blood to the brain. For all of the frustration that I hear from patients about strokes that have been missed on CT scans, though, I feel that it is necessary to celebrate when a not-so-obvious stroke is diagnosed early enough for what it actually is, and the patient is able to receive the appropriate therapy for the best shot at a positive outcome. It does actually happen, and I tell the following story to offer hope. Sometimes things run as they should on the front lines of medicine, and it is quite refreshing when things go right! A woman suddenly became very dizzy and had difficulty speaking clearly. The alignment of her eyes became skewed, and she was unable to focus on a single target. Following this, she became confused and disoriented, and was unable to move her right side. Her symptoms were fluctuating, and those around her could not figure out in that moment exactly what was occurring. She was brought to a local hospital, and the ER physician, concerned for possible stroke, called the on call neurologist. The patient had the head CT scan to the right, which was interpreted as normal by the radiologist (and which I agree is unremarkable). 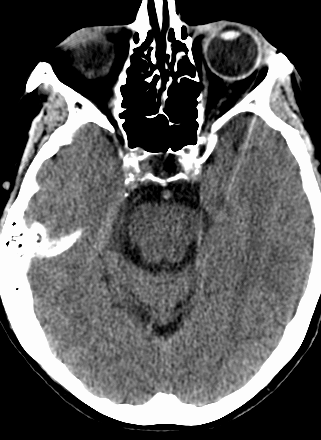 The patient received IV t-PA immediately after the CT scan was able to exclude this as a hemorrhagic stroke, on the assumption that the patient was in the midst of an early ischemic stroke. On the following morning, the patient’s right-sided weakness had completed resolved, her speech was clear, and her thinking and reasoning had returned to normal. The only symptom that remained were some visual abnormalities. At this point, that has improved as well. Her brain MRI (on the left) that was performed the following day revealed that she had, indeed, sustained an ischemic stroke. Fortunately, she was able to receive IV t-PA early enough to minimize the damage. Thank goodness the emergency medicine physician did not “rule out” stroke with her normal head CT scan. On the following night, the same emergency medicine physician was working and called about a different neurological patient. During the discussion, feedback was provided to him about how the previous night’s patient had improved, and how the MRI did confirm the presence of ischemic stroke. His response was: “It always feels good to know that you’ve made the right decision.” Yes, it certainly does. Previous postA Normal Head CT Scan Does Not "Rule Out" Ischemic Stroke - Part I Next postWhat does "do not resuscitate" really mean? I was 34 when I had a Carotid Artery Dissection and multiple strokes. I also had a CT scan when I arrived at the hospital and it was “normal”. If it wasn’t for the team of neurology specialist that were there that day I was going to be sent home. By the time they discovered my strokes it was to late for the TP treatment. I was places on IV heparin and in the NCC for weeks. I still suffer from right side weakness, foot drop and language difficulties. I lost my career in dentistry but I’m grateful to be alive.